Caremark will once again be taking part in The Great Sussex Bath Race on Sunday 22nd June 2014 to raise awareness and funds for two Sussex charities: Life Centre and Chestnut Tree Hospice. Last July, 20 of the top companies in Sussex competed for the winner's trophy in their various home-made water craft.Competitors were given 4 large barrels, rope, a bath, 6 long poles from which they had to build their raft. Teams had 1 hour in which to construct the raft and were not allowed to use any other materials except those provided.Entrants were allowed to accessorise/brand their individual craft and Caremark made sure their vessel was easily identifiable by fixing plenty of branded balloons to both ends! Spirits were running high amongst the competitors and 'Team Caremark' did not disappoint their supporters! 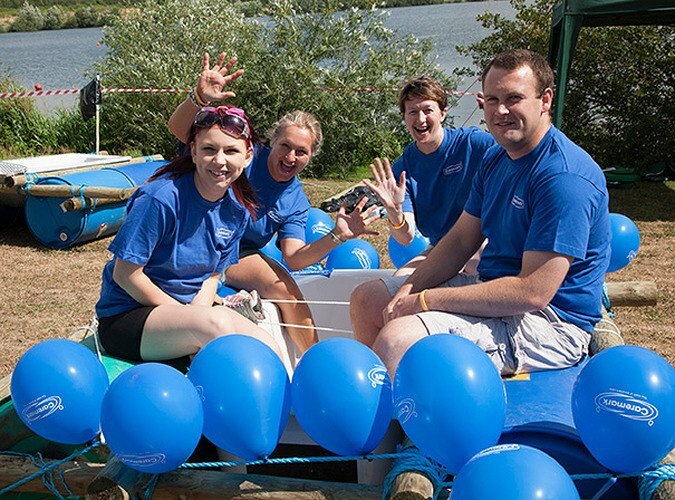 They paddled hard through the day and were rewarded later in the afternoon when they splashed to victory taking the winner's slot in the Demolition Derby.Caremark are once again looking forward to taking part in the fun charity day. This unique event attracted plenty of spectators shore-side too, who enjoyed a relaxing day supporting their various teams out on the water.